There is no doubt that the biggest life saver in human history is vaccines. The smallpox vaccine – invented in 1796 by English doctor Edward Jenner – has saved an estimated 500 million lives since. Vaccines remain an important part of our medical advances today. Immunizations for smallpox, polio and other diseases have been the key driving factor behind the fact that childhood mortality rates have been cut in half globally since 1990. Demographics say there is more growth ahead in the use of vaccines. Despite the progress made, one in five children around the globe still do not receive a full course of the most basic vaccines. From an investment viewpoint, this means the business of researching and producing vaccines should be a good growth sector. And indeed, a study from Tufts University found that vaccines in development more than tripled over the last decade. A trend likely to continue with diseases like the Zika virus in the news headlines. Tufts also found that vaccine sales had tripled in that same time period. Today, the vaccine market is worth nearly $29 billion. That includes both types of vaccines – therapeutic vaccines and preventable (pediatric) vaccines. Tufts University foresees sales swelling to $40 billion by 2020. Other forecasters have an even higher target of $55 billion to $60 billion by 2020. However, this market will be shared by just a few companies. You see, many of the major pharmaceutical companies got out of the vaccine business several years ago. It was actually not a profitable enough niche for them to remain active in it. A great example of this occurred in 2014 when Novartis (NYSE: NVS) sold its vaccines business to GlaxoSmithKline PLC (NYSE: GSK) for roughly $7 billion. 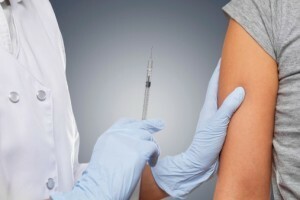 That left just a “big four” vaccine makers: the aforementioned GSK, Pfizer (NYSE: PFE), Merck (NYSE: MRK) and Sanofi SA (NYSE: SNY). For these companies, at the moment, vaccines remain a source of profit. At Pfizer, its top-selling product last year was a vaccine – Prevnar. It generated $6.25 billion in sales in 2015, three times more than its better-known Viagra drug. Prevnar prevents infections caused by the Pneumococcus bacteria. All four companies reported stronger sales growth in vaccines for 2015 than in their other pharmaceutical lines. Operating margins for vaccines were in line with other products too, with margins in the 25% to 30% range. A good portion of this growth was fueled by newly-launched immunization programs in emerging economies. Sanofi, for example, saw sales for its polio and whooping cough vaccines grow by a third in those markets last year. The only question is whether these four remaining companies in the vaccine sector can continue to make profits from vaccines. As I stated previously, other players have gotten out of the sector because of the lack of profits. And in the current environment, pricing pressures continue. Governments and worldwide health agencies have begun playing hardball with the pharmaceutical firms on drug prices. For example, the charity Médecins Sans Frontières recently mounted a challenge to Pfizer’s patent on Prevnar. It wants Indian drug companies to be allowed to produce a cheaper version of the vaccine. If this 100% focus on cost continues, the remaining four companies may abandon vaccines too. Innovations like GSK’s new malaria vaccine – the first ever – and Sanofi’s vaccine against dengue fever – which took 20 years to develop – will no longer happen. The toll will not be in dollars and cents, but in human lives. Hopefully, common sense prevails and a happy medium is reached. If it does, the “big four” vaccine makers will continue doing good for both their shareholders and the world. Ninety-seven percent of investors are missing out on the biggest dividend payments ever. Are you one of them? With the 2016 presidential election, a new wave of huge payouts could be coming very soon. Access this urgent research today … and stay up to speed on these developments with our FREE income alert service.